What does a skilled reader do when they first look at a text? They take a moment to preview the text with a simple skim and scan of the whole text BEFORE they commence close reading. It’s a bit like taking a quick look around a room when you enter to notice its layout, and the people and objects within the space. Doing so means that you know what is around you before you sit down and get settled. Will it have the answer I am looking for? Do I understand the way it is written? The problem we want to discuss today is poor previewing of online texts. Our students have a tendency to forget their previewing skills when the text exists in an online format. It seems that the ability to move the cursor, and subsequently control the reading path by continual clicking, is a distraction present in online texts that is absent in print texts. This is what poor online previewing skills looks like in our classroom. Both occur when a student first opens a website or online text. Looks like: Click and drag the scroll bar in order to rush to the bottom of the web page. Not stopping to read the headings, hyperlink or text. Immediately followed by the decision to abandon the website and return to the search engine results page. Repeat for the next website. And the next. And the next. Looks like: Click on the first link that tempts you. Immediately proceed further into the website with additional clicks, without scanning the remainder of the information available on the original webpage. 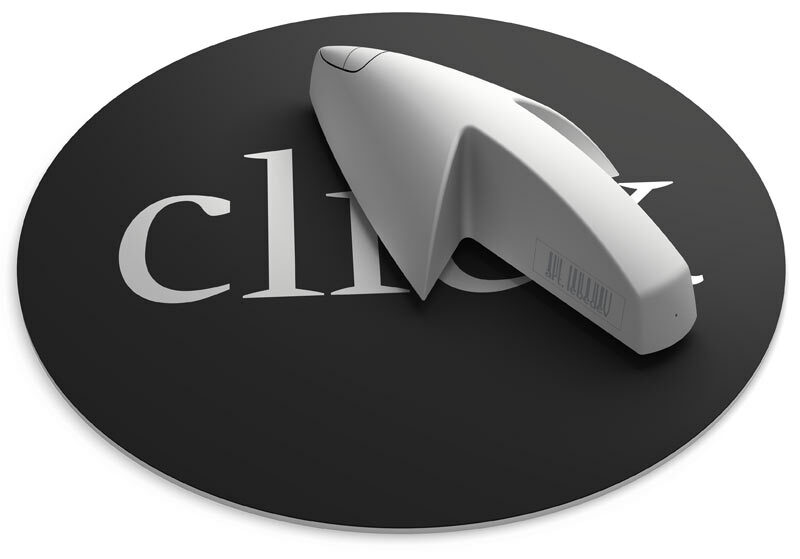 Clicking. Clicking. More clicking. Abandon the website and return to search engine results page. Repeat over and over. And over. Frustrated at seeing these bad habits even among our skilled readers, we decided to construct a lesson to counter this poor reading behaviour. We adapted the activity proposed by Julie Coiro titled ‘Evaluating Relevancy: Previewing a Website’ which is available here to devise a fun activity that forced our students to preview online texts properly BEFORE selecting one to read closely. Students had to visit six different websites and preview the information found on the home page. Each website had been chosen by us prior to the lesson and they all had varying degrees of relevance to the task set. Students had to preview the text, give it a rating according to its relevance, and justify reasons for their rating. You may scroll up and down, and left and right in order to view the entire page. You have only 1 minute to preview each website. When the ‘time’s up’ call is made you must complete the website rating below. You have 1 minute to do this. Click below to view a Prezi slide show about online reading comprehension and this task. Laptops or tablet computers – at a ratio of 1 between 3 students – set up in stations around the classroom. One ‘station’ for each website to be previewed. A simple task for students to complete – outlined in one paragraph or less. A stop watch – we used an online stopwatch and projected this on the screen. *Hint – have the websites available as hyperlink. Students often mistype URLs when asked to manually enter them and this distracts from the task. It is possible to teach students positive online reading habits, and correct poor habits. As always, they need reminding of good reading practices each time we begin an online reading task. Students wanted to complete their ratings while they previewed. Making a new rule that pens had to be DOWN during the one minute previewing period meant that students actually READ what was on the page and in doing so they actually previewed the text. Students were able to identify a variety of features of online texts which provide hints as to relevance for the task. These include: hyperlinks, logos, author, date, diagrams, images, captions, text, headings, drop-down lists, tabs etc. Having each station of laptops opened to a website, and rotating the students made the exercise more fun, and mean each website was already loaded and ready to go for the each rotation. A continuing challenge – How to assess online reading comprehension? One of the most pressing challenges we’ve faced in planning and teaching online reading comprehension has been how to assess and track students’ knowledge of online reading strategies. Originally we had hoped to use the Online Reading Comprehension Assessment tool (ORCA), developed by Professor Don Leu and the New Literacies Team from the University of Connecticut. This sophisticated assessment tool simulates an online environment where students are challenged to complete an online research problem by locating information, evaluating their search results, synthesizing information from several sources and then communicating their final solution by email. As students complete the ORCA, their choices and actions are automatically saved and coded. After visiting the research team, and testing the ORCA ourselves, we learned that it is currently being trialed with students in Connecticut and Maine. In future, the ORCA will be a valuable tool for assessing students’ online literacy skills. 1. to provide a simple measure of the internet strategies students are aware of using to complete school tasks. 2. to determine changes in students’ awareness of internet strategy use over the period of instruction. 3 to guide and inform our teaching in response to the ‘gaps’ in students’ identified online strategy knowledge. We decided to use a simple pen and paper reflection task, also developed by the New Literacies research team , “Formative Assessment of Students’ Emerging Knowledge of Internet Strategies” – FASEKIT. We administered the FASEKIT proforma at the end of the first two terms this year and we will continue to do so at the end of Terms 3 and 4. The students are encouraged to write for 10 minutes listing and describing the online reading strategies they find most useful when completing homework, or school research tasks. They also explain when, and why, they use each strategy. 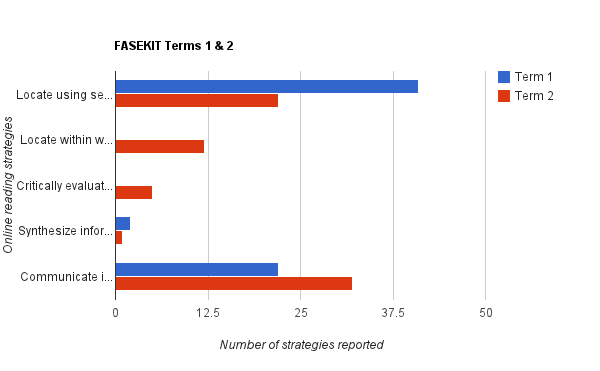 The information collected from the Term 1 FASEKIT was prior to any online reading instruction. At the end of Term 2, we returned the students’ original FASEKIT proformas and invited several students to share strategies that they had listed previously. The students then wrote for 10 minutes continuing their personal list of online reading strategies. 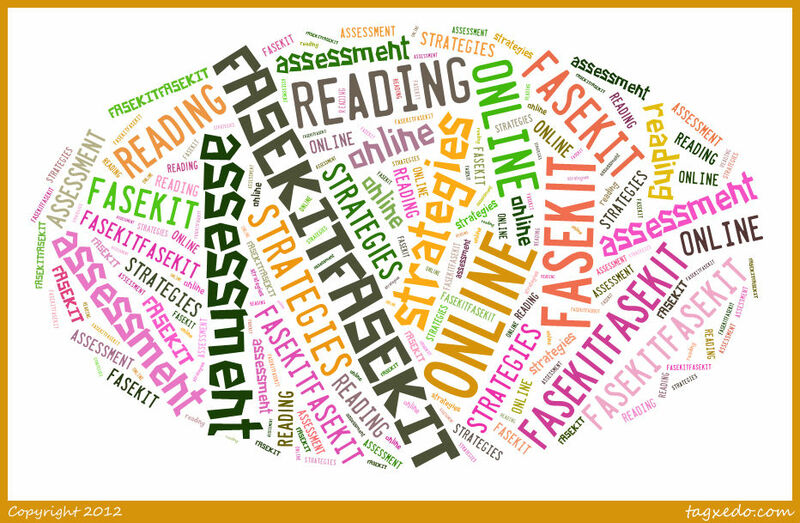 We will continue to administer the FASEKIT at the end of Term 3 & 4. Using these categories we compared the strategies the students listed at the end of Term 1 with those listed at the end of Term 2. The graph below shows that in Term 1, prior to explicit online reading comprehension instruction, most students nominated simple strategies for Locating information using a search engine such as, “Write words from the assignment sheet into Google to find out information”. The students listed a few simple strategies for Communicating information e.g.”Use print screen to save a picture of the screen when I want to back up my work or show someone”. This simple assessment tool is providing us with useful information which is informing our planning and teaching. In Term 2, we deliberately focused on teaching students strategies to help them locate and evaluate relevant information when reading online. Leu’s (2008) research identified that locating is a crucial step for effective online reading comprehension. If students are unable to navigate the internet to identify relevant information from search results, or from within a webpage, then their comprehension becomes blocked. According to Leu’s research, even compentent “offline text readers” can become defeated by reading “bottlenecks” online. During Term 3 & 4 we plan to use broader, online inquiry questions to teach different strategies for critically evaluating and synthesising online information. How many times a day do you use Google to find the answer to something? If you are anything like us, with a laptop, iPad and iPhone, or often all three, within arm’s reach all day long, the answer is OFTEN. Using these tools effectively is one aspect of online reading comprehension that we have been exploring with our class. In doing so, we discovered that while our students are comfortable using Google, they don’t really know what each element is called, nor do they stop to think about what they might find on a website before clicking the hyperlink. There are hints in search engine results and web addresses students are missing simply because they have not thought critically about what is appearing on the screen. In order to teach our students how to become proficient at using these tools and reading these texts we felt the need to establish a common vocabulary in our classroom. How did we teach this? Students know how to use search engines but not what each element of the interface was called. This is a bit like driving a car, knowing what each of the pedals does, but not what each is called. Students can manage without knowing their names, but talking about them in class will prove difficult. Students were not in the habit of deconstructing a web address to predict the type of information available. Again, they did not know what each part of the web address was called. The student groups took disparate approaches to using the internet to research names for each element, some being more successful than others, which provided us with further insight about how students use the internet to answer research questions. Look out for a subsequent blog post on observations here. We hope that the creation of this vocabulary and the activities the class has conducted so far will encourage students to LOOK closely and THINK critically as they use the internet to find the answers to research questions. A few weeks ago we asked our Year 8 class to nominate how they selected a website from a Google search result. With puzzled looks on their faces, the majority of the class responded, “We click on the first one”. When we stopped to discuss the reasons for their website choices most students explained, “I click on the first link because that would probably be the most relevant”. Although a couple of students claimed that they occasionally “skimmed the descriptions under the website headings” before making their choice, they were in the minority. So here’s a strategy we used to teach our students to more closely read a list of search results BEFORE making that first click. 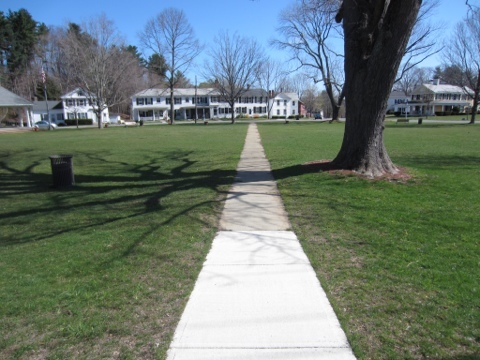 We prepared a task sheet adapted from a resource provided by Assistant Professor Julie Coiro. Here is a link to a copy of our Task sheet and a link to Julie’s really practical website brimming with great ideas for teaching online reading comprehension. The students completed the tasksheet in pairs by closely reading the list of search results, discussing their answers and then recording their justifications. As a whole class we discussed their answers. Through sharing the results of this simple, speedy pen and paper online reading comprehension task we made many discoveries. most students knew what a PDF was, but didn’t know that “edu” in a web address represented all educational institutions, not just schools. most students knew that words from a search query are shown in bold in the results, but they didn’t closely read the website snippets to find pertinent information. most students knew they needed to read beyond the website titles to identify relevant information, but one pair of students needed to be explicitly shown how to read aloud the URLs website descriptions in order to understand the information. Knowing how to select the most relevant website from a list of search results is a critical skill when reading on the Internet. It is one we intend to return to as we explicitly teach online reading comprehension. Today’s students are part of the generation sometimes referred to in the media as ‘digital natives’. Exposed to digital technologies from birth, it has been assumed by many educators that these students are ‘native’ users of technology. They automatically have the skills and knowledge required to effectively seek, locate and engage digital texts without requiring explicit instruction. And yet, teachers frequently report that students struggle to locate information when completing academic assessment tasks. It seems that students’ out-of-school Internet use does not adequately prepare them for school research tasks. These academic tasks require sophisticated online reading comprehension skills quite different to the speedy ‘Googling’ and fast skimming which students use to socialise with Facebook friends, or participate as members of online gaming communities. The comprehension skills of reading online are more complex than those required for reading offline. So how do we teach the reading comprehension skills required for effective learning in the 21st century? That’s what we will explore as we share our learnings from the classroom and beyond.